Burrowed away between the Giriama village of Fumbini and the beautiful emerald waters of Kilifi Creek lies Distant Relatives Ecolodge & Backpackers. This special place is both a message of optimism and an experimental model of environmentally and socially conscious living. 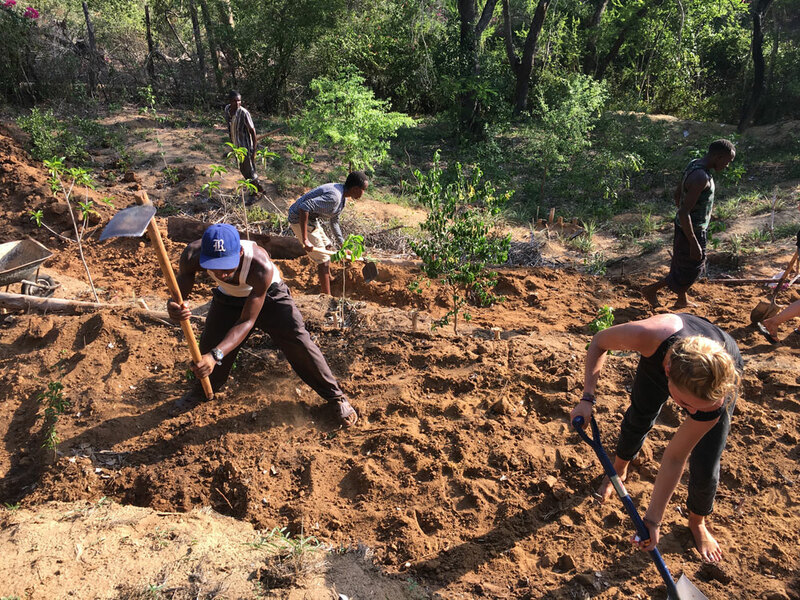 As of November 2016 we formed a beautiful partnership, took over the gardens at Distant Relatives Eco Lodge and started to run our successful Permaculture Design Courses. Our overriding goal at distant relatives is to establish a resilient landscape that can overcome the ever changing global weather patterns. By creating ecologically sound designs we are able to be more than just sustainable but actually take part in enhancing our surroundings. We have been running a variety of courses hosted at Distant Relatives. So far we have held Permaculture design courses, Practical Permaculture Workshops and a Waste Water Management Course. These courses are aimed at empowering through knowledge, by collaborating and training members of the local communities as well international guests to create a strong and enriched next generation. In the last 4 years Distant Relatives has seen more than 120 students come through. Today the Eco Lodge site is a flourishing Permaculture heaven with a graceful balance of flowing nutrients and energy improving the ecological balance in the Earth of which it sits on. With well functioning waste water systems using grey water from the kitchen, food waste from the kitchen turned into golden rich compost to a fully fledged mini-nursery booming with a variety of indigenous species, a thriving greenhouse germinating delectable herbs and fruits and vegetables! Sign Up for our courses! We welcome all ages and all experience levels to the courses we host. Stay tuned for our upcoming courses via the "Barefoot Blog" and our "Courses" page. To sing up, simply register on the course page and get ready to have a fun and a mind blowing experience!